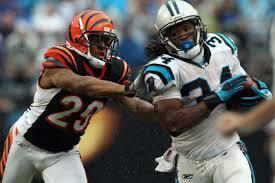 Are Panthers and Bengals headed for a Super Bowl #49 showdown? Both the Carolina Panthers and Cincinnati Bengals were playoff teams this season although they both lost home playoff games and were “one-and-out” in this year’s post-season. But if we look at the win totals of both these teams since the 2010 season, Carolina and Cincinnati are the only NFL teams that have increased their win totals in each of the last three seasons. For the Panthers, they won two games in 2010, increased that to six in 2011, added another win in 2012, and jumped up five victories to 12 this past season. The Bengals won four contests in 2010, increased to nine victories in 2011, and have added one win in each of the last two seasons. Only two other NFL teams have increased their win total in each of the last two seasons: the Miami Dolphins have increased their wins from six in 2011 to seven in 2012 and eight last season. This year’s Super Bowl champs, the Seattle Seahawks, had 13 wins in 2013 after winning 11 in 2012 and seven in 2011. On the downside of this stat are a pair of recent Super Bowl champs. The Baltimore Ravens and Green Bay Packers are the only two NFL teams that have seen their win totals decrease in each of the last two seasons. The Ravens have gone from 12 wins in 2011 to 10 in 2012 and eight last season. The Packers had 15 victories in 2011, 11 in 2012 and only eight last year. In looking at the standings from the 2013 season, we see that 14 teams increased their win total from 2012, eight had the same number of wins in 2012 and 2013, and 10 teams had fewer wins in 2013 than 2012. Here’s a look at the teams that increased their win totals most in 2013 and those that lost fewer games.